The Irish border backstop provision in the Brexit deal could continue indefinitely “unless and until it is superseded” by a new agreement, according to UK government legal advice. UK Attorney General Geoffrey Cox said he would have preferred the UK to be able to unilaterally terminate the backstop arrangement, while Theresa May’s chief Europe adviser Olly Robbins admitted the situation was “uncomfortable”. The 43-page Legal Position On The Withdrawal Agreement was published after the UK government lost a parliamentary vote calling for the full legal advice to be released. Opposition parties in the Commons – including Theresa May’s DUP allies – said the document and a statement by Mr Cox failed to meet the terms of the vote and asked Speaker John Bercow to launch contempt of Parliament proceedings. 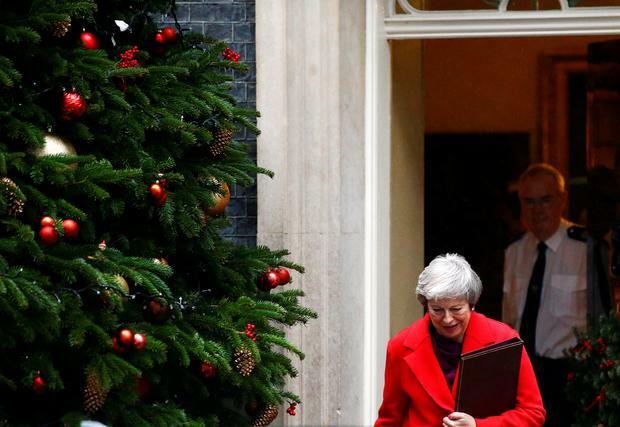 The row came after Theresa May told Tory MPs to “hold their nerve” and back her Brexit deal, insisting she would still have a job in two weeks’ time as she faces a crunch December 11 Commons vote on her EU Withdrawal Agreement. The dense legalese paper states the backstop “protocol”, which would take the whole of the UK into a customs arrangement with the EU to avoid a hard border with Ireland, would come into effect in December 2020 unless an alternative measure was in place. The document said “in the event that a subsequent agreement is not in place by then” the “protocol will continue to apply unless and until it is superseded, in whole in or part, by a subsequent agreement establishing alternative arrangements”. It goes on to say “if it does start to apply then it should do so only temporarily”, with Mr Cox arguing the Article 50 process for leaving the EU does not allow a permanent arrangement to be put in place. “I make no bones about it – I would have preferred to have seen a unilateral right of termination in this backstop,” he told MPs. Sir Keir said: “The Government has failed to publish the Attorney General’s full and final legal advice to the Cabinet, as ordered by Parliament. Earlier, Mrs May’s chief Brexit adviser told MPs the border backstop was a “slightly uncomfortable necessity” for both the UK and the European Union. The fallback plan agreed with Brussels was “not the future relationship that either the UK or the EU wants to have with one another”, Mr Robbins told the Exiting the European Union Committee. He said: “It is an uncomfortable position for both sides and the reality … is that there is not a Withdrawal Agreement without a backstop. Asked if the British government had drafted a clause for the Withdrawal Agreement that would have allowed the UK to opt out of the backstop unilaterally, Mr Robbins said: “Ministers asked us to look at a whole range of options for how to bring the backstop to an end and so we did. The UK faces making additional payments to Brussels if the Brexit implementation period is extended, the UK government’s Brexit legal advice also said. The advice says discussions on any extension would involve “reaching further agreement on the UK’s financial contribution”.